How Soon After a Car Accident Should I See a Doctor? Home / Blog / How Soon After a Car Accident Should I See a Doctor? Every car accident is different. Some can result in minor damages to your vehicle, while others can result in your vehicle being towed. In the same sense, injuries from car accidents can also vary greatly. You could be in a simple fender bender but still experience a significant soft-tissue injury like whiplash. More severe accidents can result in catastrophic injuries like traumatic brain injuries (TBI), broken bones, spinal cord injuries, or fractures and sprains. Following a car accident, it is imperative that you know when you should see a doctor. While it goes without saying that a more severe injury, like a broken bone, requires immediate medical evaluation, other times, your need for medical attention might not be so apparent. Your safest bet is to see a doctor as soon as possible following a car accident. You might feel great after walking away without a serious injury, but your body’s adrenaline could be masking any real pain or injury you might have sustained. It takes a medical professional to evaluate your condition and diagnose you with any injuries you might not be aware of. Not every injury will have a visible symptom. A stiff back following a car accident could be a symptom of a much worse back injury, and only a medical professional will be able to tell you what kind of injury you have suffered. If you truly feel that you walked away from the accident without injury, you should still remain diligent in evaluating your body following the accident. There are injuries where symptoms might not show up until days or even weeks later. If that happens, you should immediately see your doctor and make them aware of your recent car accident. While it is important to see a doctor in order to begin healing, it is also important because it created a record of your injuries from the accident. This will prove helpful should you choose to pursue legal action with the help of an experienced car accident lawyer. When seeking medical attention, you should also request copies of any documentation or prescribed treatments you may receive. Furthermore, you should also document your injuries and how they progress in the days, weeks, and months following your car accident. 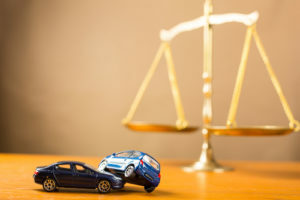 These types of documentation can go a long way toward proving your injuries and their connection to the auto accident. It would not be fair for you to have to cover the medical costs related to your injury if your accident was caused by a negligent motorist. While you concentrate on recovery, you will need a dedicated lawyer to handle the legal aspects of your car accident claim. If injured in New Jersey, look no further than the experienced legal team of Blume Forte Fried Zerres & Molinari. For more than 70 years, we have been successfully representing injured clients in Mount Olive, Rockaway, Jersey City, Middletown, and throughout New Jersey. From car accidents and truck accidents to motorcycle and pedestrian accidents, we handle it all. We will fight to get you the compensation and justice you deserve. Call (973) 635-5400 or fill out the online contact form to schedule a consultation today. We have an office located at 1 Main St, Chatham, NJ 07928, as well as offices at Jersey City, Sea Girt, and North Bergen, NJ.